In the last one month, egg prices in the country recorded a huge jump, soaring as much as 40 per cent while the prices of broiler chicken eased 25 per cent during the same time on account of 'added inventory'. In Pune, the wholesale rate of 100 eggs moved up from Rs 380 on October 12 to Rs 530 on November 12. The retail price of eggs in Pune was over Rs 6 apiece. In Delhi, the wholesale egg prices went up from Rs 375 to Rs 525 (for 100 pieces) during the same period, data aggregated by online agency Poultry Bazaar said. While the egg prices have gone up significantly, the price of broiler chicken has dipped owing to added supply from the poultry farms. According to Poultry Bazaar, the price of 1 Kg broiler chicken in the wholesale market came down from Rs 120 on October 28 to Rs 90 on November 12. The average wholesale rate of 1 Kg broiler chicken in Punjab is Rs 132 around this time of the year. Every year, egg prices witness a rise due to increase in demand during the winters. However, this year prices have moved up remarkably. "When vegetables turn costly, people switch to eggs, pushing up its rates as well. This is simple substitution effect," Raju Bhosale, executive member of the National Egg Coordination Committee (NECC) told The Indian Express. This year, the spike in egg prices is largely being attributed to the rise in prices of vegetables such as beans, cauliflower, cabbage, brinjal, etc. 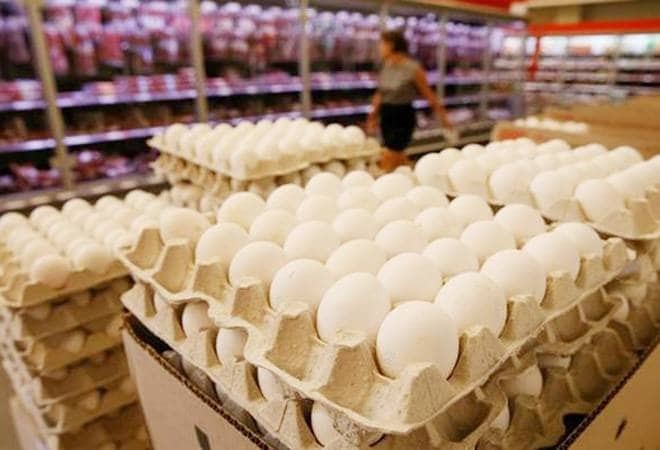 Hit by tight supply, egg prices have jumped to Rs 7-7.50 apiece in retail markets in most parts of the country, Poultry Federation of India President Ramesh Katri told PTI. The upward trend would continue in coming months as egg production is likely to be lower by 25-30 per cent this year, Katri said. "Egg prices have increased significantly as many poultry farms have reduced production for the current year because they did not get better rates last year," Katri added. Retail inflation, which touched a seven-month high in October, is expected to rise further and cross the 4 per cent mark this month, driven by rise in vegetable and oil prices. According to global financial services majors like Nomura, BofAML and Morgan Stanley, price pressures are likely to build further in the coming months following a cyclical recovery in the economy and rise in vegetable and oil prices. "We expect CPI inflation to rise above 4 per cent in November and stay above the RBI's target of 4 per cent through 2018," Nomura said in a research note. Inflation based on the monthly Wholesale Price Index (WPI) rose to six-month high of 3.59 per cent in October as compared to 2.6 per cent for in September. The retail inflation rose up to seven-month high to 3.58 in October due to the high prices of food items. According to BofAML, November CPI inflation is likely to be around 4.5 per cent.